Part of the huge crowd early in the day at Moorepark. 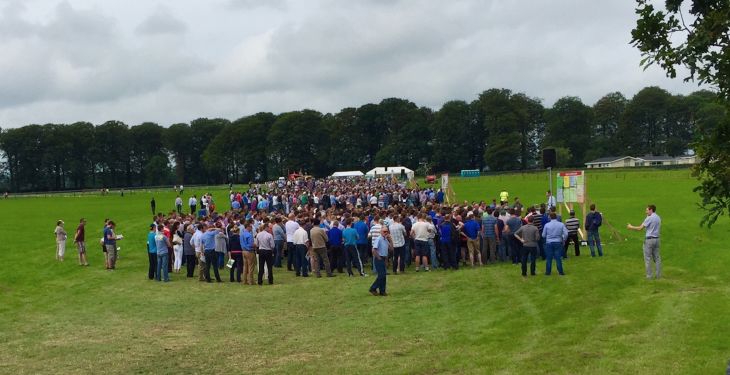 Farmers attending the Teagasc Moorepark open day were issued with a word of warning from Teagasc staff on the 2015 milk price. Despite issuing the warning, Teagasc’s Padraig Lynch said that for most dairy farmers cash flow won’t be a major concern. But, according to Lynch, farmers must be concious of what’s happening on world markets. He advised farmers to put budget together for the rest of the year taking into account poorer returns. “It’s a good idea, just to see what the numbers are like and make adjustment if you need to. Lynch said the options for farmers with problems potentially coming down the tracks included talking to the bank, identifying if there are extra beef animals on the farm that could be sold and also potentially postponing some capital investment planned for this year. 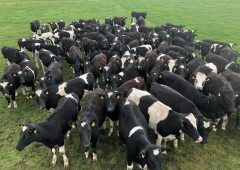 However, he said Teagasc is not discouraging farmers from investing this year, but rather advising them to look at their cash flow before starting any significant investment. Lynch’s comments followed a key theme of on the day in Moorepark of the importance of planning. The fact that we have freedom to produce more milk doesn’t mean that we should produce additional milk. “It’s down to individuals and individuals should be driven by their own business,” he said. He said it is vital that farmers know the objective and goals for there business. “Once you set your goal the rest of the planning process is very simple. “You are just putting a few numbers around where you want to go,” he said. Lynch said setting the goal for the business is the most important step and one that not enough farmers have taken.